The joke's on us: Dear readers (yes, all eight of you), we owe you an apology. It has come to our attention that early in our run of mediocrity, we passed on to you some bad information. 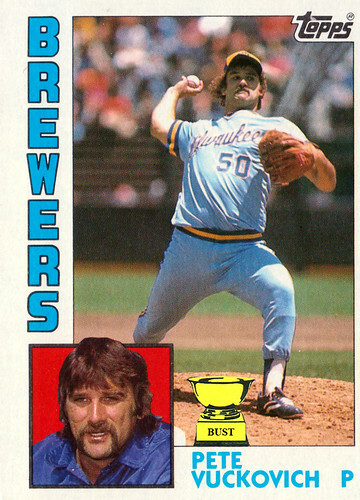 You see, Pete Vuckovich here was featured on the second card we ever posted on this site, and the story that accompanied it, it turns out, was blatantly false. Pete was never a swamp cooler repairman; in fact, his major league career lasted 11 season and he even won the Cy Young! That'll teach us to believe everything we hear from Bob Uecker.